So, this is what people's backyards looked like in Ottawa today!! It's our first storm of the season and the kids were super excited this morning! As for dinner tonight? Who wouldn't want to dive into this delicious looking dish? My mum made this recipe last week and she said it was A.M.A.Z.I.N.G! 1. Heat oil in large pot or Dutch oven over medium-high heat. Season beef. Working in 2 batches, brown meat on all sides, 6 minutes. Remove to plate. 2. Add onion to pot and reduce heat to low. Cook, stirring, until softened, 3 minutes. Add garlic and cook, stirring, 1 minute. 3. Pour in beer. Add broth, tomato paste, Worcestershire, sugar, paprika, 1/2 tsp kosher salt, and pepper to taste. 4. Return beef to pot. Simmer until meat is tender, 1 1/2 to 2 hours. 5. Stir in potatoes and carrots. Simmer until vegetables are tender and meat is very tender, 30 to 40 minutes longer. 6. Remove 1 cup of liquid from pot and slowly whisk in flour. Stir back into pot and bring to a gentle boil. Reduce heat and simmer until thickened, 10 minutes. Season. Sprinkle with parsley (if using). Serve with bread, if desired. I'm sorry this post is late today. All this snow seemed to make everything take longer today! 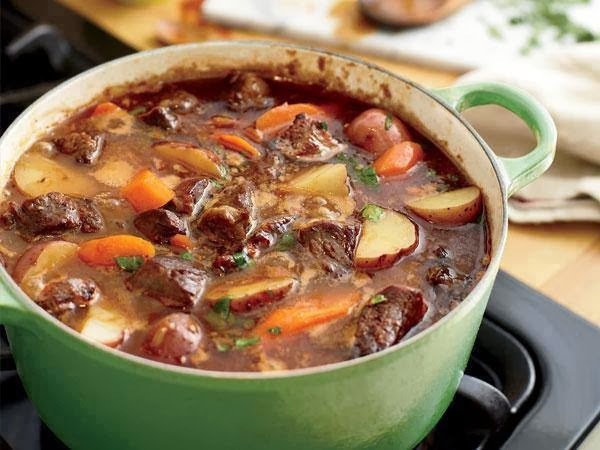 You might not have time to make this today but for sure this weekend, turn up the heat, pour a glass of vino and make you and your family this cozy warm stew. Wouldn't a fresh.fabulous.sophisticated apple crisp go deliciously well with it too? Yum. I *LOVE* beef stew! I often make it in my slow cooker when I have too many meetings/events to attend. Just throw everything in around 8 or 9 and food will be ready at 6. Can even pre-chop ingredients the night before to save more time. Although Stew's are good, they rarely look good in photos. This one looks delicious! great job! Thanks for the comment El but I can't take the credit for the photo. It belongs to "High Protein Foods". I linked them in the recipe. That's where I got the recipe. The stew is really really delish though. It's one of my go-tos!